Home Apps Free Health and Fitness App for Windows 8: Exercise Me! Exercise Me! is a free health and fitness app for Windows 8 and 8.1 computers. The app can also be installed on Windows 10 computers and Windows 10 smartphones. One can get the maximum benefit of doing an exercise if performed in a right way. 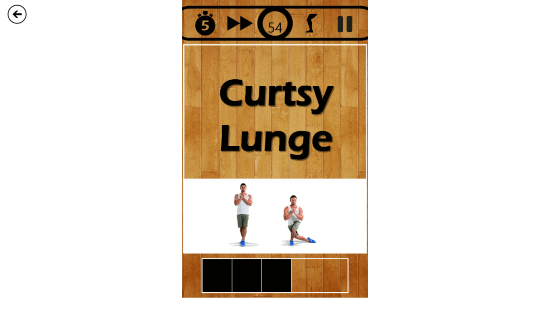 The free health and fitness app teaches you the right way to do various exercises. It contains the list of different types of exercises focused on the different parts of your body. 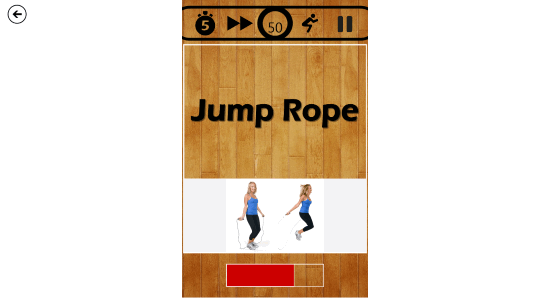 For your convenience, this health and fitness app for Windows 8 comes with four different categories of exercises and each category is further divided into subcategories. Keep your body fit and healthy by exercising in a right way. Get this app now! This lightweight health and fitness app is downloaded in just a single step. A link is provided at the end of the article, you have to just follow the link and windows will take you to the installation page. At the installation page, click on the Install button and let the app installed on your system automatically. 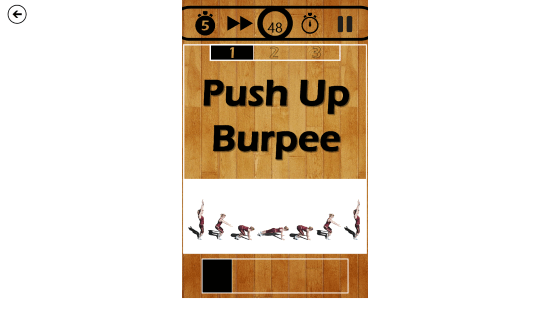 You can also download the app directly from the Microsoft Store by typing the name – Exercise Me! Body Part Focused: As the name indicates, this category contains the list of exercises that mainly focus on your body parts. This is further divided into three subcategories, viz: Arm Focused, Core Focused, and Leg Focused. For your convenience, each subcategory has three difficulty levels from easy to hard. Choose the difficulty level as per your comfort. Circuit Exercises: This category comes with the exercises that help developing body strength. Select the level of difficulty from easy to hard as per your convenience. Cardio Exercises: As the name states, this section contains the list of exercises which keep your cardiovascular system healthy. Perform these Cardio Exercises daily and keep your heart fit and healthy. Outdoor Exercises: This category contains the list of outdoor exercises. You can locate yourself by clicking on the Show Map option. This section lets you know how much distance you have traveled while walking, cycling, or running. Stretch Routine: Stretch Routine is one of the important features of this health and fitness app. Following this section, you will be able to maintain flexibility in your body. A total of five exercises related to the flexibility of the body is added to this section. Perform all of them one by one. BMI Calculator: BMI Calculator refers to Body Mass Weight Calculator. Know your fitness level. Just enter your height and weight, BMI Calculator tells you your fitness level. 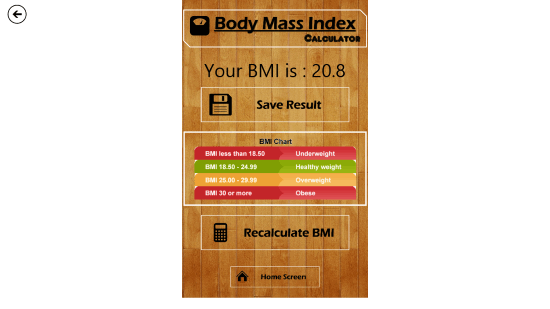 Know whether you are underweight, healthy weight, overweight, or obese by comparing your BMI result with BMI chart provided in this health and fitness app. Progress Report: Know your progress report. 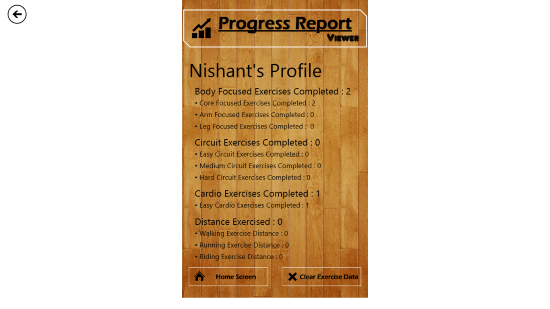 The Progress Report section shows the list of all the exercises you have completed. You can reset your results anytime. Exercise Me! is a lightweight Windows application that helps you keeping your body fit and healthy by daily exercises. Know the right way to do an exercise to get the maximum benefit. Get it now! 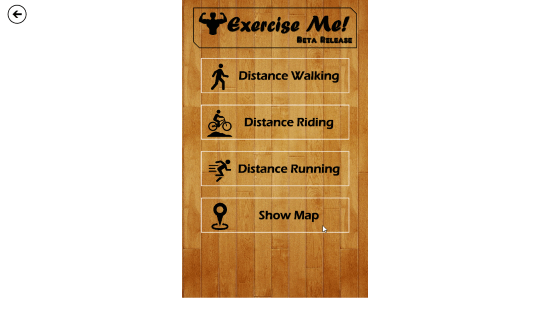 Download Exercise Me! for Windows 8, Windows 8.1, and Windows 10.